All the fighters slated to compete in tomorrow night’s “Strikeforce: Houston” event tipped the scales today at the Toyota Center in Texas. Tomorrow night’s card will feature two exciting title matches. 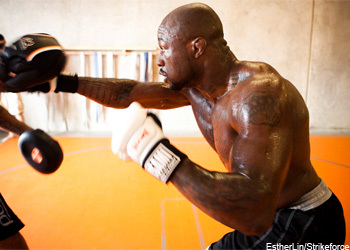 Strikeforce light heavyweight champion Muhammed “King Mo” Lawal puts his belt on the line for the first time when he meets Rafael “Feijao” Cavalcante in the show’s main event. Additionally, Tim Kennedy and Ronaldo “Jacare” Souza will battle for the open middleweight strap that was recently vacated by Jake Shields. Saturday’s Showtime broadcast airs at 10PM ET/PT. Unfortunately, only those with access to an east coast feed will be able to watch the fights live. * – Robichaux was granted an hour to lose one additional pound for the 130-pound catchweight bout. ** – Patino was unable to attend the weigh-ins and will tip the scales later this evening. *** – Gurgel will not ask Noons to shed the additional weight quarter-pound.